Alchemy is a single-player military strategy game. 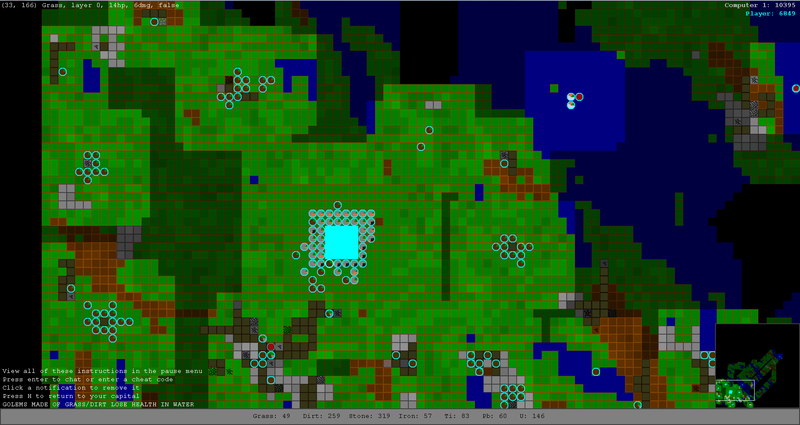 You control a nation that starts out with only a smattering of resources, used to design and build units called golems. Golems are your path to survival in this hostile, unique and completely random world. Use your golems to mine for more resources, explore the map, fight wars, and dig entire oceans. The resources you use on each golem determines its strength and ability. 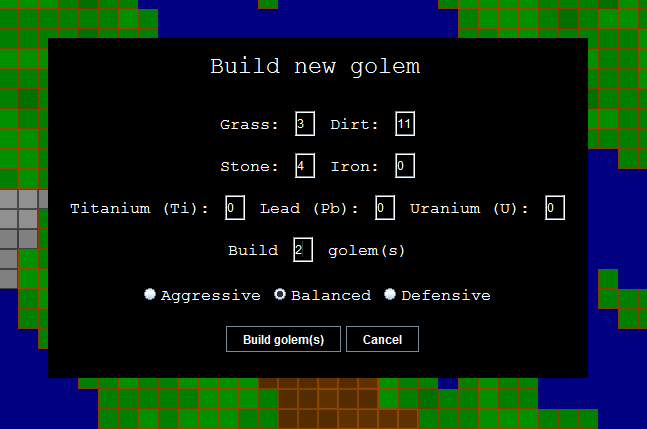 Whenever you build a new golem, a menu screen pulls up that allows you to specify how much of each resource you want to spend on your new unit. You can build a bunch of small, cheap soldiers, or you could build a couple monsterous, expensive golems. Each golem must contain between 5 and 99 total resources. Currently there are 7 resources that can be mined and used in Alchemy. More may be added in future versions. Grass: the weakest resource in the game in terms of health and attack, but allows your golems to heal themselves after they take damage. The more grass spent on the golem, the quicker the healing, but just 1 grass will allow any unit to recover to full health eventually. Be careful though, golems with either dirt or grass in them will take damage in water. Golems will refuse to enter water if they know it will kill them. Dirt: stronger than grass, but is still the second weakest resource in the game. It has no special abilities, but is extremely common. Like grass, golems with dirt in them will take damage in water. Stone: a basic, durable resource which doesn't take damage in water. It's quite common several layers under the surface. Iron: stronger than stone, but without any special abilities. Titanium: a rare, powerful resource. Titanium improves a golems attack and movement speed enormously. It is also quite good for mining. Lead: another rare resource. Lead has extremely high health, but low attack and speed. It's useful in forming a wall or a defensive force. Uranium: the final rare resource. Uranium deals radiation damage to enemy golems from a distance, and is very useful in taking out armies of enemy golems. However, uranium is weak when it comes to mining or melee combat. More information is available on the "For Nerds" page, and detailed instructions (about controls, etc.) are included with the game. Copyright Drew Pendergrass 2014. Legal only in international waters.